Hummingbirds are native to both Americas, reaching as far as pacific coast of British Columbia (Canada) on the northern hemisphere down to the Tierra del Fuego (southern Argentina) on the opposite side of the south continent. Obviously the far north and south offer very difficult conditions for birds habitats where only few winter-hardened species can survives like for example Anna’s Hummingbird. Not surprisingly the biggest concentrations of humming-bird’s species are in humid, equatorial rainforests of Columbia, Equator (with the record of 163 species), Mexico Brazil ….. In continental US there are only 16 hummingbird species – all but one breeding on the west coast. The Ruby-throated hummingbird choosing his living habitat in eastern US is an exception. Canada enjoys only 4 hummingbird species thus they are easy to name: Anna’s, Black-chinned, Calliope and the most popular Rufous. OK, so before more facts from the mysterious life of hummingbirds let's see what the Free Humming-Birds Park Pictures captured in photos. The name humming-bird comes from the word “hum” associated with the noise of their fast flapping wings. This vibrations-induced buzz is the dominant “vocal” signature of humming-birds. In some countries however - specifically in Europe, hummingbirds are called Colibris (Kolibris). Hummingbirds are known as the smallest of all birds. The smallest of the family – a Bee-Hummingbird breeding in Cuba weights about 2.2 grams (0.08 ounce) and measures about 5.7 cm ( 2.25 inches). The largest one – a Giant Hummingbird living in South America weights about 20 grams (0.7 ounce) and measures up to staggering 20 cm (8 inches) in length. The most amazing are their flying skills. Understandably thanks to their very small size and weight they are very agile. They can flap wings at the frequency from 25 per second (medium sized hummingbirds) to up to 100 per second – for the smallest ones. They can hover in a mid-air in an apparent motionlessness while intensely flapping the wings, they can suddenly change direction going up, down and sideways. And if it is not enough - they are the only birds that can fly backwards. All that thanks to the hummingbirds’ ability to rotate their wings in a circle. Hummingbirds feed on a nectar from flowers. Their unusually long bills are well adapted to the task of extracting nectar from the interior of flowers. But the nectar is very poor in proteins and in general nutrients – necessary as a source of energy to support rapid wings beating. They compensate that deficiency by preying on insects and spiders. To sustain their lives each day they have to eat more than the weight of their body. In order to save the energy they go to a kind or hibernation-mode during the night (called torpor) when they can slow their metabolism to about 15% or that during a day. The highest recorded heart beat-rate of humming-birds reached unimaginable 1260 beats per second and most likely this is not the limit. Many humming-bird species are migratory and it seems almost like a miracle that they can fly non-stop for long distances. With so high rate of metabolism they barely survive nights most time living at the edge of starvation. Hummingbirds in the Iguacu Foz Tropicana Birds’ Park. 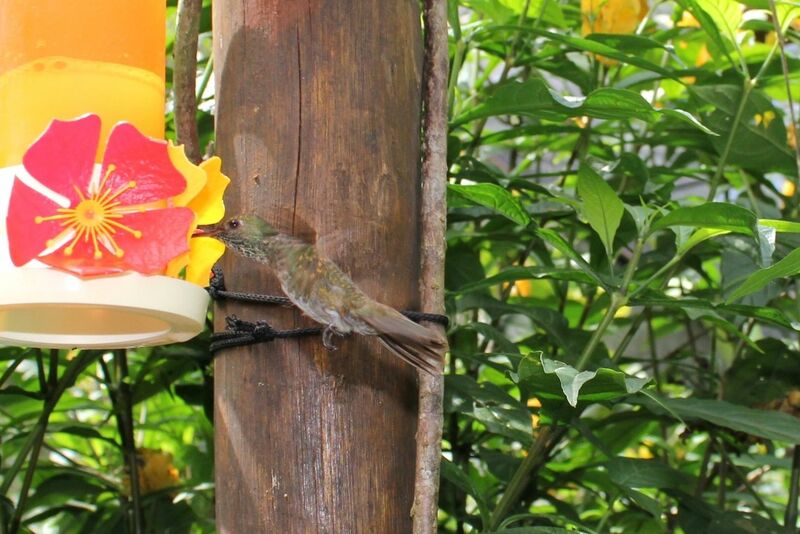 At first it may be surprising for us to see humming birds in the butterfly house. Yet once again this is an example of the resourcefulness of the Mother Nature and triumph of human “out of the box” vision. The large spiders’ webs sown on a daily basis in the Butterfly House turned out to be deadly traps for “unsuspecting” butterflies. They were dying there by hundreds. Once the administration of the birds’ park introduced hummingbirds – the job was done, all that without any chemicals, pesticides etc…. just an “organic way” beneficial for everybody – butterflies (so they can have their lives), humming-birds (so they get their proteins) and us, visitors – so we can admire all of them. Taking the good quality picture of the hummingbird (especially when in flight) is a very difficult task. These little babies are fast like bullets reaching the speed of up to 54 km/hr (34 miles/hr), quickly - in a split second move forward, backwards or sideways. It really makes a photographer’s task very difficult requiring not only the best skills and camera but also a lot of patience. And at the end of the photo-session he/she still stays with only few “so-so” pictures in the hands. I can only say – chapeau to those succeeding in this task and so sorry to those that may be not satisfied with the quality of photos provided by the Free Humming-birds Park Pictures. But please keep my words – I’m working on it.